More like Poe Daaaaaaaaamneron, right? Anyway, your eyes do not deceive you. Masculinity Monday is back, albeit temporarily. From September 15 to October 15, we're celebrating National Hispanic/Latino Heritage Month, and part of that means going through and dissecting the representation of Hispanic and Latino characters throughout our culture, particularly in how they relate to expressions of masculinity and femininity. We started off last week by looking at the woefully underappreciated Isabelle Lightwood on Shadowhunters, and we'll continue this week by tackling Hispanics and Latinos in space with The Force Awakens' Poe Dameron. Ready? Good. So I'm sure I don't need to remind all of you about the plot of Star Wars: The Force Awakens, as this was the movie that everyone and their grandmother was downright ecstatic about seeing last December, but you might not remember the whole story from Poe Dameron's perspective, so let's look at what happened in Episode VII from his point of view. 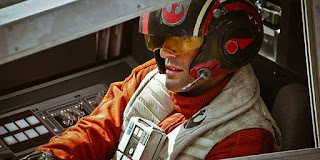 Poe Dameron (Oscar Isaac) is the best pilot in the Resistance. Like, hands down, no contest, absolutely the best. He's literally their poster boy, and judging by the way he looks casually posing on the side of an Xwing, I wouldn't be shocked if he's painted on more than a few spaceship noses like the bombshell babes of World War II. Poe Dameron is a damn good pilot. Even more than that, though, we know from the very beginning of the story that he's also an incredibly trustworthy and good man. How do we know this? Because General Leia Organa has chosen Poe Dameron out of the entire Resistance to be the one to track down the missing map that will lead them to where Luke Skywalker has been sulking for the past ten years. But the real moment when we get that, hell yes Poe Dameron is a wonderful man, comes when some random stormtrooper comes and starts marching him down the hall in a halfbaked escape plan. Poe would be well within his rights to react badly to this. He could assume it's a trap, he could berate the stormtrooper (John Boyega) for not thinking this through, he could try to fight the guy and escape on his own. All of these would be normal action hero reactions. Instead, Poe shrugs and agrees to help. In fact, he does more than that. He smiles and he trusts and he treats this stormtrooper, who doesn't even have a name, as a person with just as much value and integrity as him. And bear in mind that this is the enemy. 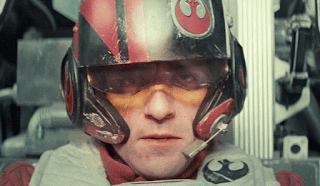 Poe Dameron is the kind of man who takes his own enemy at face value and immediately forgives and forgets that not two hours ago this man was shooting at him and was part of the force that killed a village. He believes this man when he says he wants to change. Poe Dameron is a good, good human being. So when the ship crashes and Finn, who spends the rest of the film going by the name Poe gave him, thinks he's dead, there's no small part of loss and remorse there. We actually completely understand why Finn would be devastated over the loss of a stranger he met not fifteen minutes before. Poe might have been a new person in Finn's life, but he irrevocably changed him, to the point where when Finn has to think of a new identity, a new person to be now that he's free of the First Order, he immediately chooses to be just like Poe. He can't think of anyone better to be. Now we've already covered Finn in his own article, but I think it's hard to overstate how pivotal this character interaction is. I mean, in and out of the world of the film. 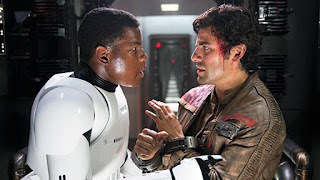 Hell, the chemistry between these two characters was so good, and the storyline was so moving, that JJ Abrams actually decided not to kill Poe off and instead make him one of the main characters of the franchise. Seriously. Poe was supposed to die in the plane crash, but now he's a pivotal figure in the story because how do you kill someone so completely made of puppies and sunshine? Later, as we come to understand from Poe's minor appearances in the rest of the film and the novelization which fleshes it out more, Poe escapes from the desert on Jakku, makes his way back to the Resistance, and is able to fly his ship in a battle where he spots Finn and saves him and they reunite, yay. But to be honest, Poe's presence in the rest of the movie, aside from the heartclenching jacket scene, is pretty minimal (because he was supposed to be dead), so we're going to talk larger picture about his character and why he matters. So, to begin with, I think it's worth noting that Poe Dameron is a man of color. I mean, duh, that's why we're talking about him for National Hispanic/Latino Heritage Month, but still. It's worth noting because it is tragically rare to find depictions of Hispanic or Latinx characters in science fiction or in space. I mean, I've got Michelle Rodriguez in a few things, and I guess Zoe Saldana, though her characters are rarely Latina, but that's about it. Gina Torres in Firefly? There's not a lot here, is what I'm saying. To have a main character in Star Wars be openly and proudly Hispanic, then, is a big deal. An even bigger deal, though, is how they work his racial identity into the story. See, when Oscar Isaac was cast, because the role was relatively small, the writers didn't put much effort into his backstory. Isaac, who is Guatemalan, was allowed to come up with a lot of it on his own. This is significant, because it led to Poe Dameron's entire history as a legacy member of the Resistance. You see, Star Wars: A New Hope, the one with the original Death Star, shot the rebel base parts in Guatemala. Isaac and his family had joked for years that this meant they lived on the same world as the rebel base: Yavin IV. And that meant that when Oscar Isaac was coming up with a backstory for Poe Dameron, he said that Poe grew up on Yavin IV as part of the rebellion. This might be a little roundabout, but I hope you see what this does. 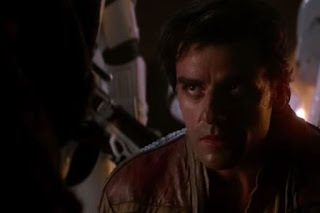 By claiming the rebel base as his characer's home territory and by firmly linking it to his own Latin American roots, Isaac effectively claims the rebellion and the rebel base for people of color. He populates it with Poe's family, he gives us a history of this place that is not white or Eurocentric. It's still an imaginary world, but it's an imaginary world that doesn't belong just to white audiences. And that's huge. On top of that, Poe's character development only gets deeper and more interesting as time goes on. 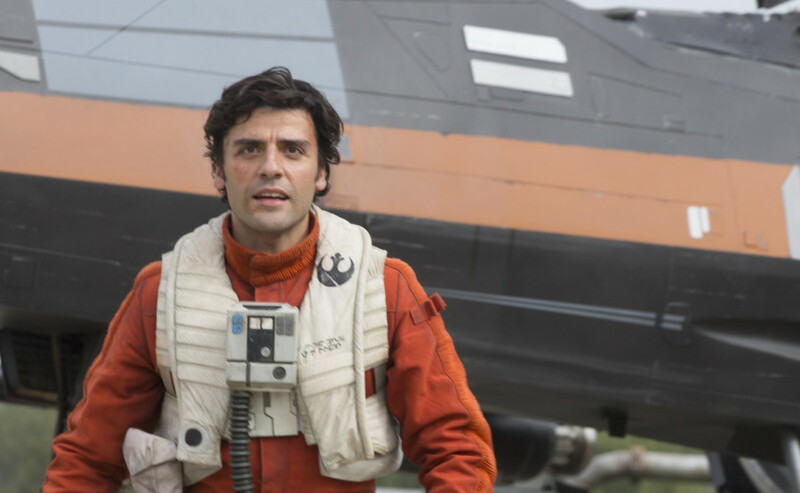 We now know that while Poe is a rebel legacy, he's also a legacy pilot. His mother, Shara Bey, was one of the best pilots of the rebellion until she died when he was young. He has lived with her memory and honor and also legacy for his whole life, which adds shade and nuance to his skill at flying and also his daredevil tendencies. Or how about how Poe seems to gravitate to strong female role models? There are a lot of jokes about how Poe has probably accidentally called General Organa "Mom" at least once, but these jokes also hint at the larger dynamic going on here. Just like the prequels and the original films all center around a trio of characters whose stories will interlock and interplay and affect the galaxy, these new movies do too, and the characters are clear analogues of characters from the original. I mean, it's no hard leap to say that Rey (Daisy Ridley) is the new Luke Skywalker, but it's also not hard when you think about it to see that Finn is the new Han Solo. He's the one haunted by his past, trying to run from what he can't control about his life, but ultimately turning around and helping the resistance even though he thinks it's a terrible idea. Which leaves Poe as Leia. Strategic, compassionate, but also dang passionate, Poe reflects Leia's ability to govern and to lead. He might not explicitly be in charge of their forces, but I don't doubt at all that Leia is grooming this man for leadership. He has future General written all over him, and between his amazing personality, his genuine appreciation and affection for people, and his talent as a commander and pilot, I don't doubt he'll do well. Poe is a great man, but he's also a good one. And that makes him a fantastically interesting character to examine in relation to our cultural stereotypes about Hispanic/Latino masculinity. Now, I do not purport to be an expert on masculinity or Hispanic/Latino culture, but I can say that mainstream white American media has some pretty clear ideas of what Hispanic and Latino men are "supposed" to look and act like. First off, there's an implication of class. Rarely do we get depictions of Hispanic men who are wealthy or successful or respected. We also rarely get to see stories about Hispanic men who are on the straight and narrow and never have not been. If anything, the portrayal of Poe is subversive if only for how normal his character is. He's just some guy who is really good at his job and really sweet. This flies in the face of normal Hispanic and Latino representation. Hispanic and Latino men rarely get the opportunity to be soft on screen. And I don't mean wussy or childish, I mean soft like a gentle hug and a kind word. I mean Poe Dameron. The guy seems incapable of thinking the worst of anyone, even his bitterest enemy. He's spent his whole life fighting stormtroopers, his mother died fighting this war, and yet at the first sign of friendship he is willing to literally give his life to save a man he just met. That's not a masculinity you see every day at all, let alone one you see depicted as a reasonable representation of Hispanic/Latino men. Poe is subversive and important precisely because he is so good. He is so good. He is basically goodness itself wrapped up in a slightly snarky package, and that's a character we rarely see associated with Hispanic/Latino culture. Even better, though, is that he's allowed to be that good and to live. They changed the story so he could go on and stay good and keep fighting the good fight. That's phenomenal, and I want a hundred more like him. We talk a lot on here about how representations can have real world consequences. How the constant depiction of Hispanic and Latino men as drug dealers and gangbangers and illiterate immigrants is damaging to them and to our society as a whole. But we rarely get the chance to talk about the opposite. We rarely get the chance to discuss how a soft masculinity, a masculinity that cares and forgives and claims and nurtures, being associated with Hispanic/Latino culture can heal our society just a little bit. 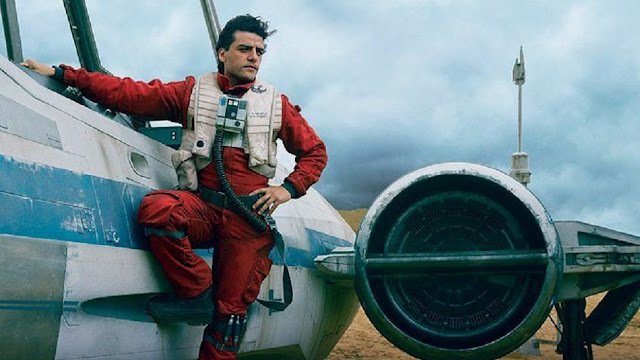 I love Poe Dameron. I really really do. But even more than I love him as a character, I love what he says about masculinity. I love that he's strong, he's never less than masculine, but he's still soft. He's still kind. He's still so fundamentally good. I want more of that, full stop. But I especially want more characters like him who expand our world. Who give us a Star Wars where everyone matters to the resistance and no one is left behind. Who would give his life for his friends or even his enemies. Who is all of this and more, and also living fully in his identity as a Hispanic/Latino man. *Those scenes where he faces off against Kylo Ren (Adam Driver) are great and funny and tragic and all things interesting from a storytelling standpoint, but I deeply wonder if Poe knows who this guy is. I mean, as a child of the rebellion, I think it's a safe bet that Poe would have known Ben Solo growing up, or at least known of him. Does he know that Kylo Ren is Ben Solo? Does he know that his possible childhood friend is a merciless killing machine? Does he think that Kylo Ren killed a boy he used to know? What does Poe think?! I need to know this. There are Mr Rogers memes that have been edited to say "Be the person Poe Dameron believes you to be." And that's why he's so cool - because the really cool people want evryone to be as cool as they are. Leia is firmly established in the movies (and the extended universe) as being a very good and very reliable judge of character ... and ... He smiles and he trusts and he treats this stormtrooper, who doesn't even have a name, as a person with just as much value and integrity as him. Putting those together, he has that same quality; he's a good immediate judge of people. And that's what Leia sees him, beyond the daredevil. On the off chance that somebody focuses on the predominant press all the time, they may have heard the term 'dangerous manliness'. Furthermore, regardless of whether they don't focus on this wellspring of data, they may have still heard this term. I find a good website about escorts in London. If you need you can visit this site.